Purchase a suite at King Blue Condominiums before November 29, 2013 and receive up to $35,000 cash back AND only a 10 per cent deposit requirement! This opportunity is fabulous, considering the fact that King Blue is the Entertainment District’s best-selling condominium. Live at King Street West and Peter Street in this Easton’s Group of Hotels’ residence and walk to an incredible array of sophisticated urban amenities. Steps away, you will find theatres, nightlife, restaurants, boutiques, shopping, galleries, Air Canada Centre, Rogers Centre, Roy Thomson Hall, TIFF Bell Lightbox and access to the PATH system. Comprised of 44- and 48-storey towers by Page + Steele / IBI Architects, King Blue will offer astounding views of all of this, and beyond. The fascinating design for King Blue includes the preservation of elements of the historic Westinghouse building façade by ERA Architects. 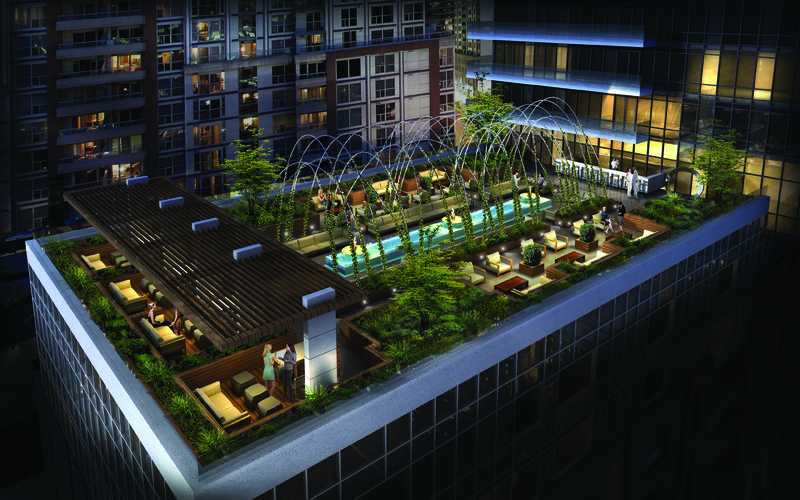 Among the condominium’s amenities will be the BEST rooftop terrace in Toronto, featuring seating, floating fire pits, a bar, illuminated ivy-covered metal trellises and water features. Residents will also have the exclusive use of a pool, chic party room, theatre room, equipped fitness centre, gourmet kitchen, guest suites and hotel-inspired customer service. In addition, 9,000 square feet has been set aside for the new permanent home of the Theatre Museum of Canada, and there will be thousands of square feet of retail on the ground and second floors. Suite prices begin from $199,900! Be sure to stop by King Blue’s exciting Presentation Centre at 355 King Street West. Find out more at www.kingbluecondos.ca!